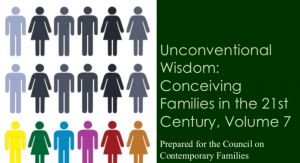 In preparation for the Council on Contemporary Families’ March 2 Annual Conference, Conceiving Families in the 21st Century, the Council asked speakers and CCF Senior Scholars to submit recent research related to the facts and dilemmas of the legal, medical, and social creation of families. The result: Unconventional Wisdom, vol. 7 (out today!) is a highly readable, non-technical survey with fifteen research updates, edited by Joshua Coleman and Stephanie Coontz. Psychologist Coleman and historian Coontz edited the first edition of Unconventional Wisdom in 2007. Eleven years later, the CCF’s new report concludes with a focused, annotated resource list of recent trends and useful facts related to reproductive health and policy. · As reported by Mary Ann Mason (University of California-Berkeley), a 2013 international study determined that five million babies had been born from assisted reproductive technology. Hard figures, not to mention outcomes for surrogates and infants, are hard to track, with dire consequences for all, including the children who are created. Professor of Law Lisa C. Ikemoto, notes that global businesses evade restrictions enacted by governments to move ova, sperm and embryos, infertility specialists, egg donors and surrogate mothers across national boundaries. · Research shared by Caroline Sten Hartnett (University of South Carolina) shows that categories of “intended” versus “unintended” pregnancy don’t capture how women think of their births. · A less-considered way of making families includes those who are not having children: Amy Blackstone (University of Maine) advances information about how well those families are doing. · Not all can rely on families to advance for well-being. Rutgers (Camden) sociologist Joan Maya Mazelis’s brief highlights community organizations aimed at helping impoverished people with no family to help out. · What does college debt have to do with making families? Arielle Kuperberg (The University of North Carolina-Greensboro) reports on how debt influences how and when women (but not men) have children.